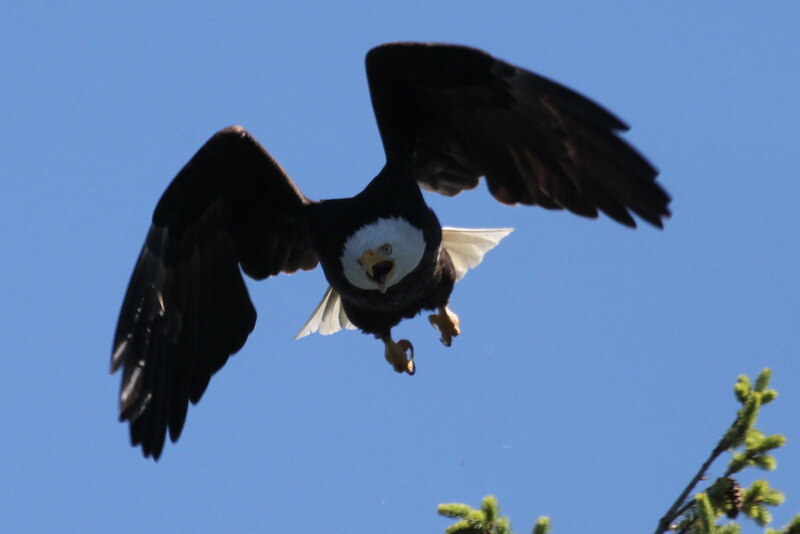 Adult eagle near Nest 20. Another adult, with staining on (her?) face, was on another tree nearby but the photos didn't turn out clearly. Meanwhile there were faint squeeing sounds coming from the nest. The day was warm enough for both parents to be off the nest. At Shingle Spit the next day, I also observed the nest uncovered, and both parents on nearby trees, for the first time this year. This week when we were at the Periwinkle beach access, i could hear the sound of two distinct Eaglets. Either Nest #20 had two Eaglets, or we are hearing the Eaglets from Nest #20 & 21. 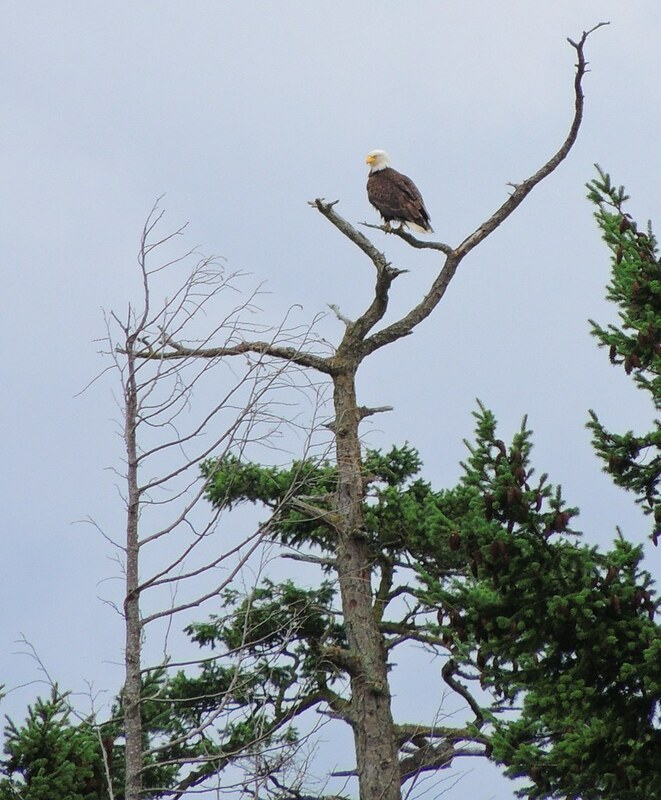 On this day, this adult Eagle was in a perch tree close to the Nest #20 border. So this is either Dad Nest #20 or perhaps the Periwinkle male. wow havent looked here in a long time fantastic shots Wren~~ Did you duck??? Wow booni, I wonder haw many of these are off springs of Mom and Dad Hornby?? Today at 8am i got a wildlife call. Good thing i*d been awake since 6am & had had coffee already. 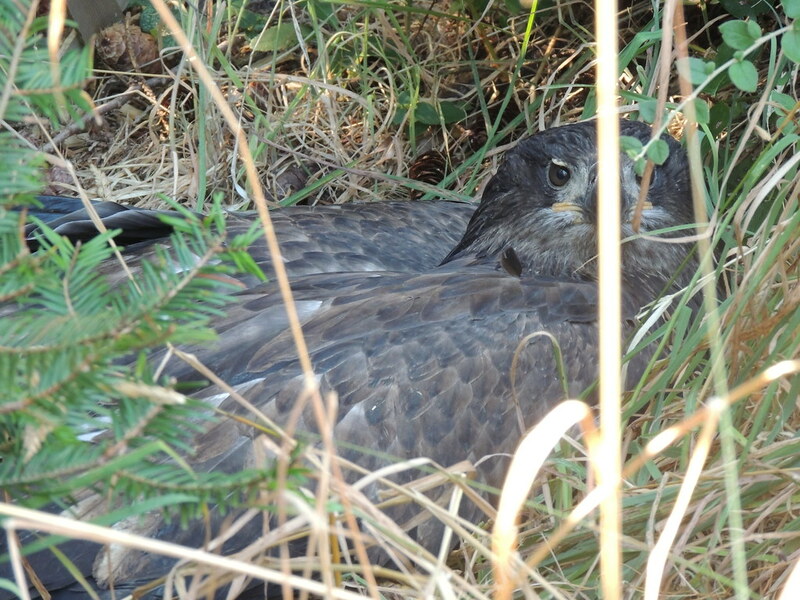 A man was calling to say that a young Eagle was floundering around in his yard & seemed to be hiding in the Salal. Another youngster was in a tree overhead. i told him i would call MARS & get back to him. The man who answered the phone at MARS said young Eagles are kind of clumsy, so to watch & wait & Reg would call me once he got in. When i called the man back, he said the young Eagle had disappeared. 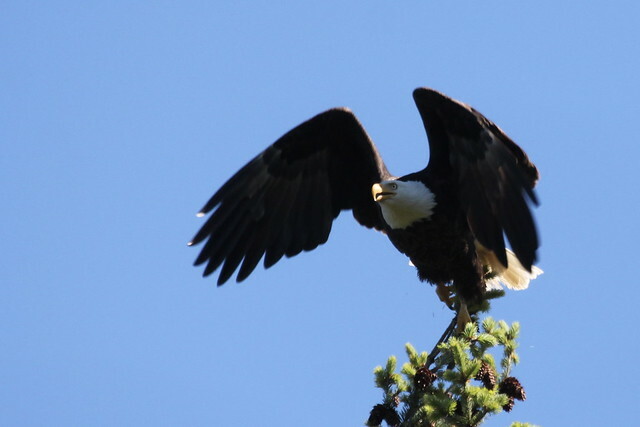 i said, Eagles are really good at hiding, could he be in the Salal? So he went to look. Keep watching & call me back, i said. Then he called back to say a neighbour had seen wings flapping & the young Eagle was gone. i asked him to check the Salal again, just in case. He said he went out there with a kayak paddle & kind of rattled the Salal but the Eagle was no longer hiding in there. Well, maybe he flew away & all was fine then! i went back to my coffee & posting Osprey fotos. My phone was ringing again. i figured the man was calling me back. But this time it was a woman! She had a wildlife concern. A young Eagle had just flown into her yard & was making his way into the Salal, but was now up against the fence & she felt sorry for him. She has watched Eagles before, but this seemed like strange behaviour to her. i told her about the report i had just gotten & the man who had reported. So the youngster had just flown to one of the properties near the original sighting. i told her this wasn*t sounding good, but that i was waiting for advice from the people at MARS who knew way more than i do. i told her i would call her back. Then i called the original caller back & filled him in. He knew which neighbours i was talking about. Okay, gulping coffee now, getting hyper, i*d better eat my oats & start to get ready. i was greatly relieved when Reg called, & i breathlessly told him the story. He said to go take a look, see what i thought, i had seen enough Eagles to know if this one was okay. But he thought this sounded like a capture was needed. Okay, now i*m out the door. i got to the place & pulled over then got out & prepared my capture gear - Kennel/carrier open & handy at the back door of the van, capture gloves for me & a spare pair for a helper, the big Fish net (darn, i still need to reline it with soft cotton material), my big brown capture towel, goggles. Then i went trucking in there. The people quietly showed me where the youngster was, i was surprised how close we were able to go to him! He was lying down on his belly, like a baby does in the Nest, his wings a bit open & relaxed, looking at us. He was in a shallow ditch, up next to a wooden fence. i took some fotos to document. Then i asked if anyone wanted to help. i gave one my spare set of welder gloves & the big net. The other got a big towel. i told them i would go in for the capture, using my towel, & that they were to try to block the youngster from escaping, using the towel & net to distract him. i wondered if i would be able to just go in there & grab him, but he got up & started heading away along the fence line. One of the men came around in front of him & walked towards him. i chased him along the fence line til he found a hole & went under! The three of us went running around the fence into the next yard. & he was heading towards a woodpile. i told the men, let*s corner him up against the woodpile. The woodpile stopped him & he opened up his wings wide. i put the towel over his head & he calmed. i was able to find the right leg easily, but had a bit of trouble with the left. He had his wings open so i asked the guys to try to tuck the wings in against his body so that i could hold them with my arms which were holding the youngster*s legs. i think we got one wing tucked & maybe the other was just hanging down. We hurried back to the waiting kennel & they held the door open so that i could pop him in head first & take back my capture towel as he went through, tail last. MARS had given me two fleece blankets & wren had left little clips to hold them to the carrier without the blankets being able to blow off. i covered the kennel to make the youngster feel safe & dark & we put him in the shade. i then called MARS to let them know we had him & would be getting him in to them. Then i made phone calls. The two people i called didn*t answer, so i left messages. Dawn had offered to pick this youngster up at Buckley Bay, THANK YOU Dawn! ♥ what a relief, so i just had to figure out a way to get him to Buckley Bay. i put away all my capture gear then asked one of the men to help me lift the kennel back into the van. While we were loading, the original caller came by & saw that we had succeeded. Then the neighbour of Nest #20 pulled over to have a chat. 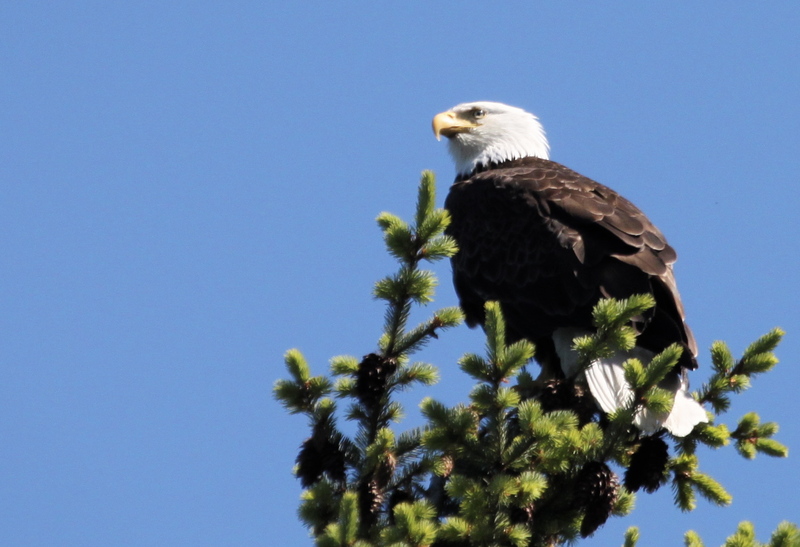 Turns out he has decided there were actually TWO Eaglets in his Nest this year! He had been thinking one all along! i had been hearing two distinct Eaglet calls from Periwinkle, but figured maybe it was one from Nest #20 & another from Nest #21. But maybe this is the second Eaglet from Nest #20! Well, no one has called back, so i am off to the Hornby ferry. i will try my luck with the lineup there. It is a busy holiday weekend, hopefully there is someone in the lineup who will take him to Dawn at Buckley Bay. It was a lovely pokey drive across the Island, there was a great feeling of relief. i got to the ferry lineup & it was short, as the ferry had just pulled away, heading to Denman. So i parked the van in the shade & went to stare in the windows of all the cars left in the lineup. A lot of the cars were full of people & stuff. What i wanted was a truck with an open bed. Well, there was one in the lineup. i found the owner & pleaded with them. i think they think i am pulling their leg for a good bit. But he agrees to take the kennel! We wait til the ferry is almost here then transfer the kennel into the back of his truck, sliding it up against the cab. There is a tire on a rim which he pushed against the kennel to keep it in place. Thanks to wren*s clips, the two fleece blankets would stay in place & not blow around. We called Dawn & i let them talk to each other to set up their meeting. Eaglet is on the way to MARS. Once again booni....thank you! 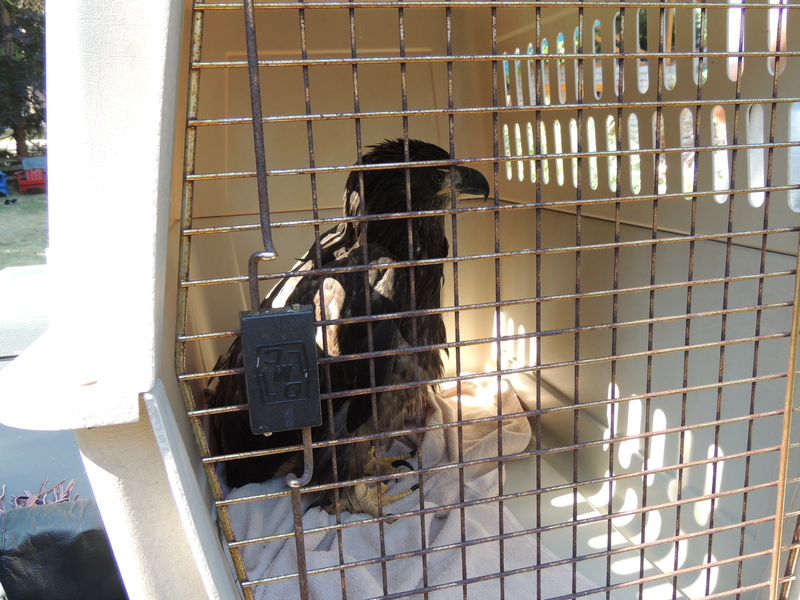 I hope this is the last rescue of an eaglet this season!! 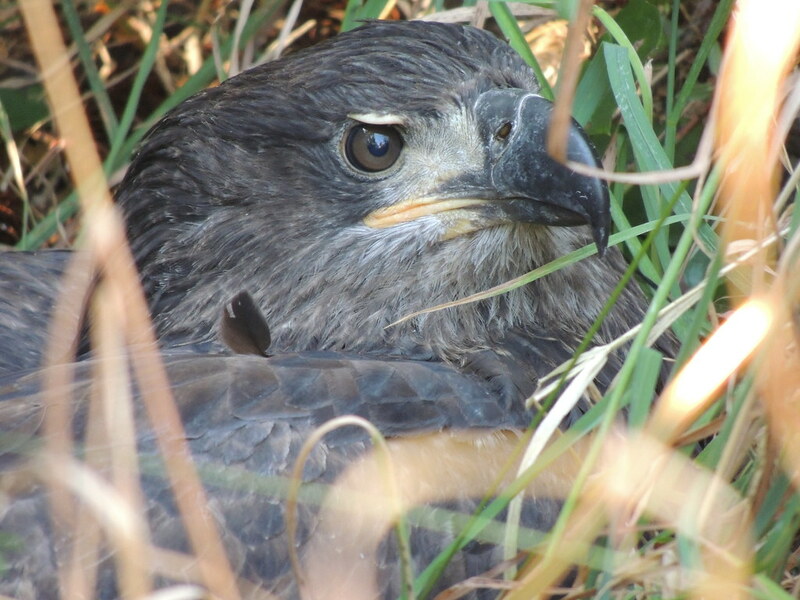 TY to guy with a truck at ferry and Dawn for making the drive to MARS with this beautiful eaglet! Fantastic HEART work! Thank you for the story Booni and thanks to everyone who got this young one off to MARS for the help it needs. Good job all around!! Booni, I am always holding my breath while reading your accounts - it felt like I was right there with you! 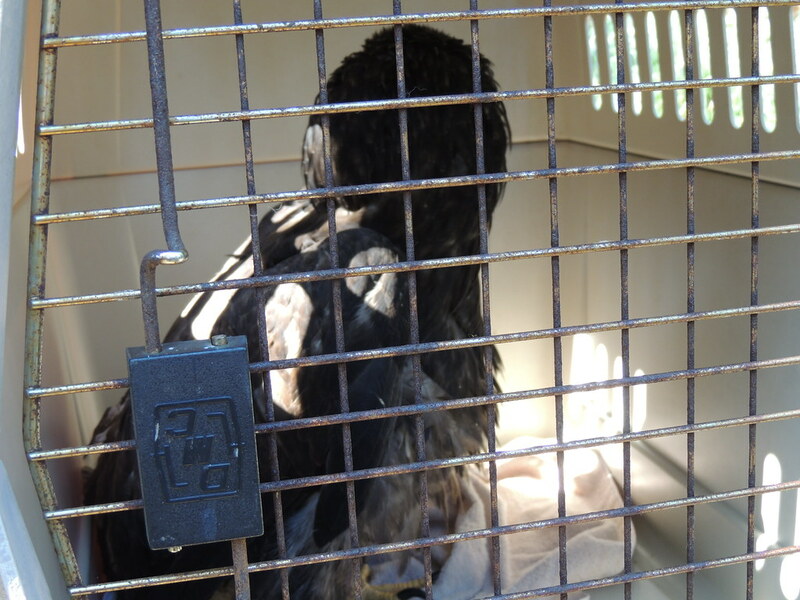 It's good that you had two people volunteer to help in the actual rescue, and of course the truck driver who took the eaglet over on the ferry. Great work! Great work again HEART - I loved your account of the rescue Booni - what an exhausting morning you had! Thank you, thank you! Booni, my heart was in my throat as I read your account, so I can imagine how you must have felt! I wonder if it ever gets to be easier! Thanks so much to everyone who helped. 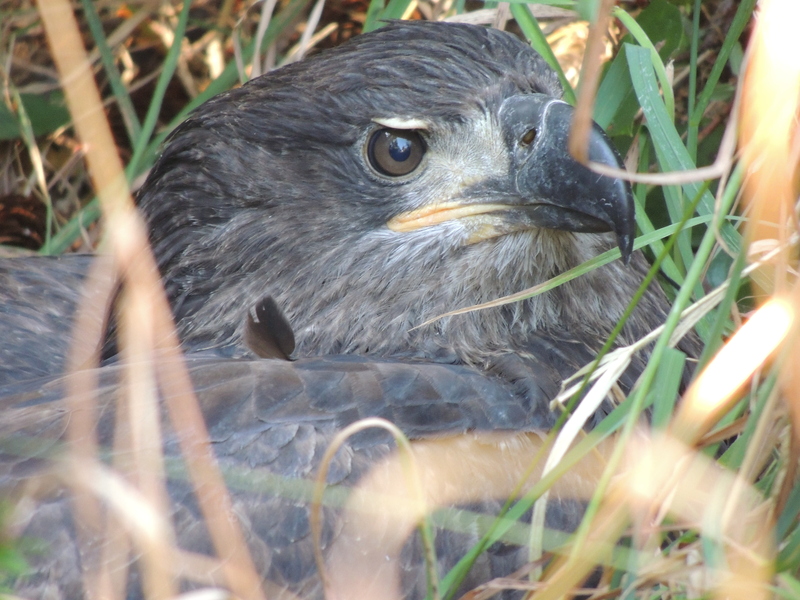 i took a few fotos of the fledgling Eaglet to document her. Sometimes you see way more in a foto than in the excitement of the live moment. Here she is, as i first spotted her. She is in the shallow gulley, next to the wooden fence. She is all flattened out & huge, lying down there, like the babies do in the Nest. i LOVE how these Nest #20 Eaglets have those scowly yellow skin eyebrows! Here is our sweetie in the kennel/carrier that Madrona donated to HEART! Lots of space for an Eagle to stand up straight, turn around or lie down. These people had a ping pong table on their lawn, which was the perfect height to pop an Eaglet into. i left the door open & the bottom is lined with a towel for them to grip with their feet so they don*t skitter around on the bottom & get frightened. i haven*t covered the kennel yet with the two fleece blankets. This first foto is ten minutes after the foto in the first post. 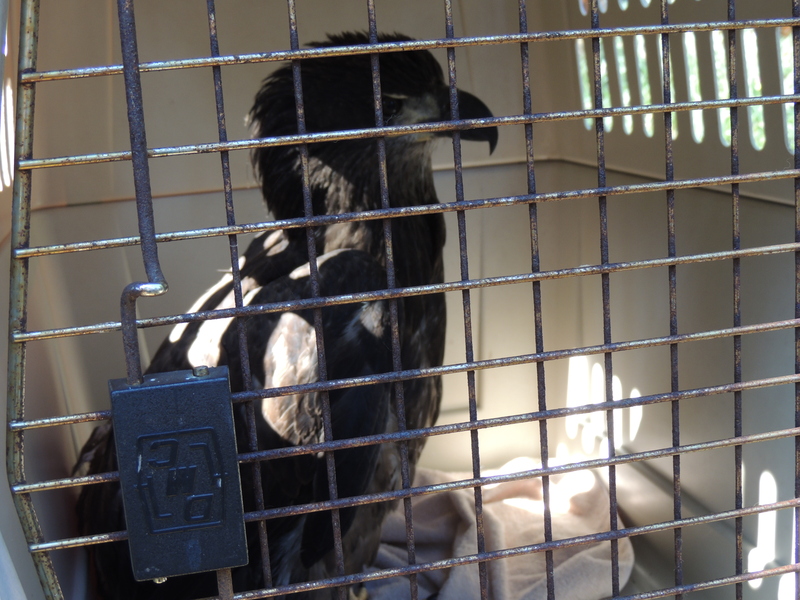 Less stress for the Eaglet, the faster we can get a hold of her. Here*s the back of her head. When i peeked in, her head looked HUGE! You can see her feet here. To me they look very pale yellow in this foto, not the lovely orangey yellow of an Eagle that is eating well. Perhaps they are a bit thin & dehydrated, too. It has been very hot here, & who knows how long it has been since her last meal? The talons are a lovely shiny noticeable black. After this foto, i covered up the holes in the kennel with the fleece blankets, & clipped them to the holes to keep them there. We moved her to the shade & quiet while i made phonecalls. Great photos of her Booni... ty.... she is a beauty for sure. Glad to hear she seems to be doing well... again ty for the rescue and ty Dawn for transporting her to MARS.... and a big ty to the unknown man in the truck who took her across the ferry to Dawn.... Great team!! !